In 2017 Glock and Smith & Wesson introduced the Gen5 and 2.0 versions of their compact pistols: the G19 and M&P Compact. This size pistol is practically perfect for CCW and duty applications because they carry plenty of ammunition and the size fits a lot of folk’s hands. Both pistols are priced so they don’t break the bank, around $550. At first glance the upgraded pistols look surprisingly like the previous versions. This is not the case; there have been substantial changes to them. What you notice first on both pistols is the grip texturing is more aggressive to give you a better purchase. After several hundred rounds we found both pistols are perform equally well. This is 16 mixed rounds of our test ammunition offhand at 20 yards. Both companies are also including additional backstraps to further enhance the fit of their pistols. In my opinion this is the best change since earlier polymer pistols have not seemed to fit people who have smaller hands. Glock was cheered for removing the annoying finger grooves; I give them two thumbs up. A flared magwell was also added to the frame, which I am ambivalent about. The next change is the trigger. My personal Glock 17 and 19 pistols as well as my M&Ps are all first generation. The triggers were mushy on both until I either worked on the contact surfaces or replaced the trigger groups. To make the pistols even we mounted Wilson Combat Vickers Elite Combat Sights. The Gen5 and 2.0 triggers for a general purpose handgun were perfect. I prefer a 5lb-ish crisp trigger on all of my pistols. 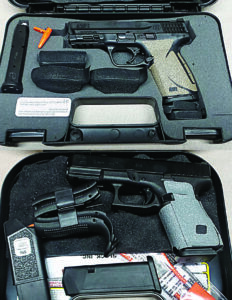 These pistols arrived from Glock and Smith & Wesson with 5lb-ish triggers. Personally I would not change out the triggers on these service-type pistols. Over the years I have seen too many issues with aftermarket triggers. On a pistol that I may have to use for a lethal force encounter, I know the factory trigger will ignite whatever factory ammunition I carry. As I have shot them both triggers have become smoother and crisper. Both pistols now have aggressive texturing to overcome the complaint that polymer pistols are too smooth. Both pistols had standard factory sights. While serviceable, they are too boxy for my taste. In my humble opinion, replacing the sights is all either pistol needs to make them perfect for virtually any application. We will discuss that shortly. Glock’s most significant change with the Gen5 is the barrel. The traditional polygonal rifling of Glock barrels has been replaced with the Glock Marksman Barrel. The rifling is more aggressive which should allow the pistols to accurately shoot polymer coated bullets which seem to dominate the reloading market. Accuracy with 147-grain Ibjiheads and Blue Bullets was on par with Federals 147-grain full metal jacket, which is one of the most accurate 9mm loads on the market. The flared mag well of the Gen5 Glocks aids in reloads and keeping your hand high on the frame. Smith’s biggest enhancement with the 2.0 is a more rigid frame. This is accomplished by extending the frame chassis to the end of the frame. While it may not sound like a big deal this reduces frame flexing which enhances accuracy. Trusted sources tell me the 5” models are true tack drivers. The last major changes were to the slides of both pistols. Glock rounded the front of the slide and frame to make holstering easier. 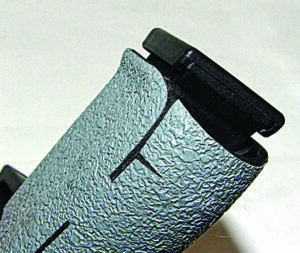 Smith added small cocking serrations to the slide which do aid in press checking the pistol. If you didn’t know it, you would miss the last change. Glock is now using a DLC coating on the slide while Smith is using Armornite on their slides. Both of these coating will make the pistols more impervious to the elements while reducing friction. I wanted to make range evaluations as equal as possible so a couple of items were added to both pistols. These additions were Wilson Combat Vickers Elite Combat Sights and Talon Grips Rubber Grips. This would make the two pistols as identical as possible. These are the cutouts on the 2.0 M&Ps, you can see the black stainless sleeve through them. I chose Wilson Combat VEC Sights because they give one of the best sight pictures I have come across in the last twenty plus years. The “U” notch rear is sharp, your eyes naturally center the front sight and it allows plenty of daylight around the front post. For those of us with well over-20 eyes, it gives you a clearer front sight. The other advantage of Wilson sights is you can get a fiber optic, tritium, plain black or gold bead—whichever best fits your needs. For this project I went with fiber optic. Fiber optic fronts tend to be the most versatile. Both sets of sights were dead on at twenty yards. The plain black rear is $49.95, while the single tritium Is $64.95; the front sight will set you back $24.95 to $74.95. Talon Grips Rubber Grip was chosen so both pistols would feel the same in the hand. Some folks prefer the more aggressive texturing of these pistols while others find it to be too aggressive. Talon Rubber Grips would be a good compromise. At $17. Smith & Wesson’s Compact 2.0 and Glock’s G19Gen5 ship with backstraps and extra magazines; all you need to make either pistol fit your hand. 99 these grips are a steal and seem to wear like iron; while giving a secure grip in all but monsoon conditions. To test the accuracy of the M&P and Glock I dug out hollowpoint ammunition from Black Hills, Federal, Hornady and Sig Sauer. The ammunition mix was Black Hills 115-grain full metal jacket, 124-grain hollow points; Federal 115-grain Syntech and 135-grain HST; Hornady 115-grain XTP American Handgunner and 135-grain FlexLock and Sig Sauer 124-grain VCrown hollow points. This assortment would cover quality training and self-defense loads. 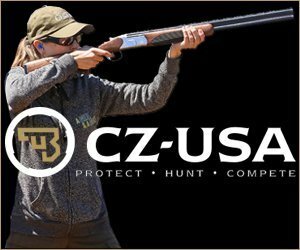 Testing was pretty straightforward; load magazines of each ammo and shoot ten rounds offhand at 20 yards for practical accuracy and reliability. Then from the bench five shots of each load were fired at 20 yards to see just how well the M&P and Glock performed. What I found was both pistols consistently fired sub 3.25” groups offhand and all of the test loads from the bench hovered at 2.5”. 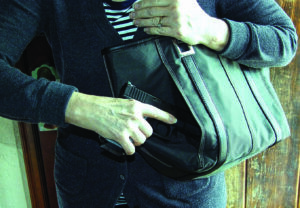 Glock’s G19Gen is easily concealed and carried in the holster of this 5.11 Tactical purse when a holster is not an option. A few of my associates were at the range while I was doing the testing so they all fired some rounds too. 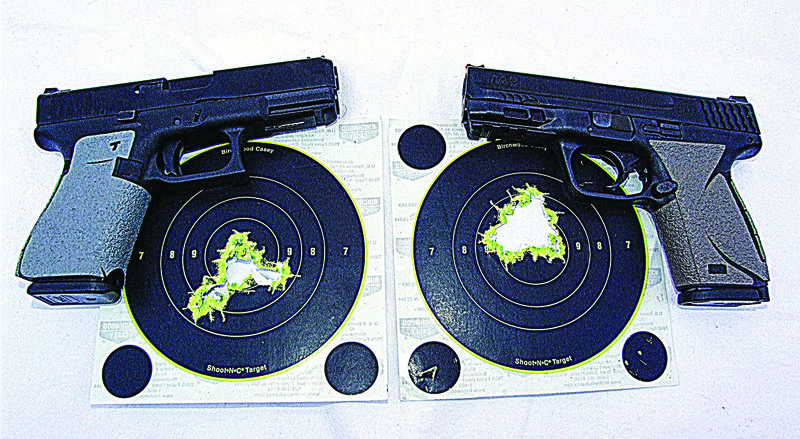 After a couple test rounds four of the shooters were keeping ten rounds inside the “8 Ring” of the Shoot-N-C Targets, which is 4”. That is pretty goof for not being familiar with either pistol. This shows Smith & Wesson and Glock, with the 2.0 Compact and Gen5 G19, offer pistols that are reliable and easy to learn. That is the key when you are going to use the firearm for duty or self-defense. 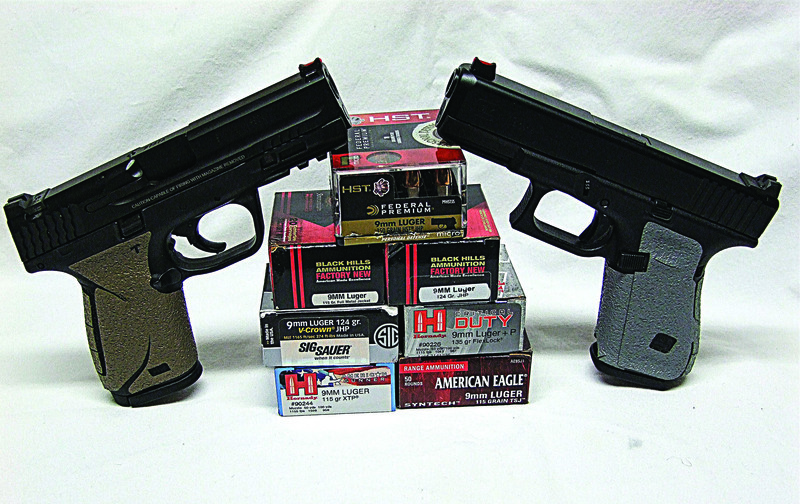 What I found testing these two pistols is modern handguns are accurate, reliable and will out shoot the operator. Over a few trips to the range folks pointed out, small things make a difference in what works best. 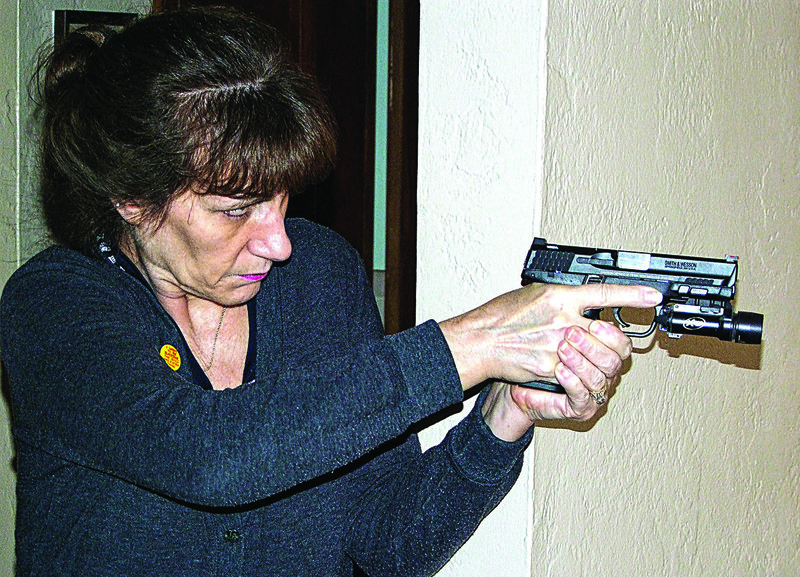 When some women shot these pistols they liked the slight flare of the G19; it forced their hands up into the trigger guard. The guys with big hands liked the beavertail backstraps that prevented slide bite. Both women and men also liked that the M&P had the smaller grip. Some liked the extension at the rear of the grip. 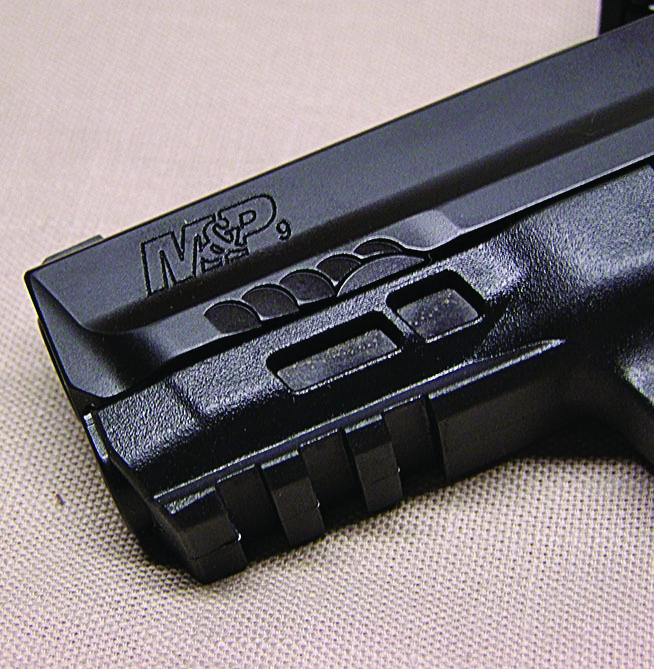 For home defense mount a Surefire light to Smith & Wesson’s M&P Compact 2.0 Picatinny rail and you are ready. One thing a couple of folks noted was the mag extension of the M&P so you can use full size magazines. 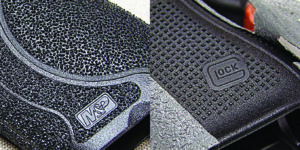 If you can, try out the new Gen5 G19 or M&P Compact 2.0 to see what you like best. Check with your friends and see if they have one you can shoot. If that does not work, check local ranges to see if they rent pistols. If all else fails, try both pistols numerous times to see what feels best in your hand before plunking down your hard earned cash. We want you to have a handgun that fits so you shoot it well.